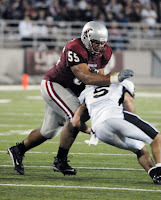 With Hawk covering off on his thoughts on the D Tackles the other day, I thought it would be a good idea to turn our attention to the other side of the line and examine what I believe to be the strongest overall unit on the 2008 Cougar football team. Several weeks ago, we were approached by a writer from a SoCal sports blog who was looking for some insight into WSU’s 2008 football season. He asked us to contribute our thoughts on a handful of questions and we were happy to oblige. As a former “steakeater” myself (OK, my glory days ended after high school, so I was more of a “chilidogeater”) I jumped on the question about the O Line. Freshman lineman Andrew Roxas was one bright spot for the Cougars last year as he played center for the first time against UCLA and performed quite well. How is the left side of the line coming along with the return of Roxas and Vaughn Lesuma? Like I said, this guy writes for a SoCal sports blog so I assume that’s why he has such an interest in Roxas (pronounced Ro-Hoss), who hails from LaCanada, CA. He was indeed a pleasant surprise as a true freshman. He performed admirably and got some valuable game experience but is still flying under the radar a bit in 2008. The 2007 team lacked depth on the offensive front and the emergence of Roxas was a very pleasant surprise. In my opinion, the O Line was the best-performing unit on last year’s squad and they are poised to keep that title in 2008. In fact, I think they’ll be much better this year and we look to be in great shape BEYOND 2008. The only loss on the line from last year is the very consistent, if unspectacular Bobby Byrd. He had prototypical size for a left tackle but was actually moved to guard due to the emergence of Micah Hannam. Frankly, we won’t miss Bobby Byrd – but there is one other departure that will be missed – Offensive Line Coach George Yarno. He was not retained by new head-man Paul Wulff, in what was largely considered a disappointing move. George is an old pro and always got every ounce of effort out of his pupils. There’s no such thing as “un-tapped potential” if you knocked heads for Coach Yarno – he got every ounce of potential out of his players and then some. Considered a strong candidate to replace Wulff at EWU, the Spokane native proved to be too big of a fish for the pond in Cheney and has landed on John Gruden’s staff in Tampa Bay. We were lucky to have him and it’s a damn shame that he’s gone. After strong rumblings that Yarno would be replaced with former Coug and current Montana State O Line Coach Jason McEndoo, Wulff chose the largely unknown (in these parts, anyway) Harold Etheridge. The last three entries on Etheridge’s coaching resume are Army, North Texas and Northern Illinois. With a collegiate coaching career that has spanned 19 years, Etheridge has a few feathers in his cap but it would seem that if were a truly great coach, he’d have had an opportunity at a BCS school before now. My sources within the program are about as reliable as the 7-day weather forecast in Seattle, but I’m told that Etheridge is having trouble fitting in with the staff. The good news is that this O Line unit has the ability to rise above any coaching sho rtcomings due to the strong leadership of junior center Kenny Alfred. Alfred is a very solid, student of the game. He’s unheralded but does an incredible job of making the right calls at the line and playing his position. Only injury will keep him from post-season conference accolades. With the new coaching staff in place and a slew of young up-and-comers fighting for spots on the depth chart, it’s probably too early to say on which side of the line they’ll line up, but the starters should be Alfred at center; Dan Rowlands and Roxas at guard; and the massive Vaughn Lesuma and Hannam at tackle. Lesuma was the best of all the newcomers to the program in 2007. He was a steady performer all year and will likely be looked upon to anchor this year’s squad. As big as he is, he could anchor the Queen Mary. If he can improve his footwork and play quicker than his 6’5”, 329 lb frame would otherwise suggest, he has a great shot to play on Sundays in 2009. Coach Wullf seems to think so too. Fighting for playing time and providing some much needed depth are four highly-touted redshirt freshmen: Kevin Freitag, Steven Ayers, Will Hunter and BJ Guerra (a converted D-tackle.) Sophomore Joe Eppelle and junior Reed Lesuma (Vaughn’s “little” brother), will also be pushing the incumbents. The recent announcement that new recruit Tim Hodgdon will grayshirt this year provides further proof that this unit is well-stocked in 2008. With so much youth and experience along the offensive front, this position appears to be in great shape for the foreseeable future. The questions along the O line heading into 2007 were all about experience and depth. With those questions now answered, the biggest question heading into 2008 has to be about conditioning. The game of football is generally played with short bursts of energy followed by a “rest” in the huddle. The big guys on the line usually need that rest more than their playmaking teammates. With the new no-huddle offense, the breaks in action will be few and far between and it stands to reason that the offensive linemen will be the ones who have the hardest time adjusting to this perpetual motion. Hopefully a long summer under the watchful eye of conditioning coach Rob Oviatt has done the trick. We’ll find out soon enough. The season kicks off in four short weeks. Here’s to the fat guys! You are currently browsing the archives for the George Yarno category.